Bare Minerals was my first foray into makeup and who knew all these years later I would still be using (and loving) it. It’s not the only makeup I use but I do my Bare Minerals beauty routine at least 3 times a week. It’s just the go-to for my le no makeup look look. I like the ‘matte’ versions of the foundation better as I need all the help I can get in the shine control department. It also contains spf 15. The trick is to only use a little bit (actually this goes for all Bare Minerals products). A little goes a long way. Just swirl, tap and buff (technique is shown in the video). There are so many shades to choose from… you will have no trouble finding one that matches your unique skin tone. I would suggest going to a Bare Minerals or Sephora store and having a professional match you with your perfect shade. This is used like bronzer to highlight the bone structure of the face and give you a natural tanned look- like you’ve just gotten back from vacation. The key is to apply only to the points on your face that would get the most sun (this technique is highlighted in the video). This is the finishing powder that sets your makeup and even more importantly blends out any harsh lines you have created with the Warmth. I really like their blushes. I’ve tried Laughter, Joyous Jennifer and Beauty and have liked them all. In this video I use the shade Beauty. This is such a great product! It goes on over your applied makeup and softens and luminizes your look. It gives your skin the appearance of being viewed through a soft focus lens… very flattering. The radiance collection comes in different colors but I find Clear Radiance the easiest to work with. The brushes I use in the video are all by Bare Minerals but are over five years old. I take care of my brushes by washing them once a week and they last a really long time. As you can see in this video I only use three different brushes: the flawless face brush (powder brush), the angled face brush and the concealer brush. But really you could get away with only using two brushes (the concealer brush isn’t necessary if you have a concealer and brush you already use). It is important to use the actual Bare Minerals brushes as they are designed for the product. When you swirl, tap and buff the mineral product is more evenly distributed in the skin. It is also important to note that the kabuki brush is a great brush too although I didn’t use it in the video. The kabuki brush is great for applying the Mineral Veil. I would love to know… what is your experience with mineral makeup? Image: clockwise from the top: Mineral Veil, Blush, Warmth, Matte Foundation and Clear Radiance. And one final note... the music in the video is composed by me. I call the piece Arabella's Symphony. When I lived in Paris one of the things that greatly impressed me were the homemade desserts we enjoyed on a regular basis. Madame Chic had her arsenal of recipes. Fruit tarts were her specialty- mainly apple in the winter and strawberry in the summer- but she also liked to make crêpes, custards, fruit salads and cake. Madame Bohemienne had a few dessert recipes she always made as well but my favorite was her flourless chocolate cake. That cake was so moist and delicious… It looked very simple but was a show stopper and the ultimate pièce de résistance at her dinner parties. She told me it was really easy to make and that she didn’t even use a recipe anymore- she had made it so many times the steps and ingredients were engrained in her memory. Having a signature cake recipe, a simple one that you can make easily and that you can perfect, is a great thing to have. Since being back in America I have searched high and low for a flourless chocolate cake recipe that rivals that of Madame Bohemienne’s and I have found one that I can now call my own. This recipe is from the Epicurious website. It’s a delicious recipe and oh so French. The ingredients are very simple, as are the steps (everything is mixed in one bowl- which also cuts down on cleaning time). The ingredients are also common- you will most likely have these things on hand in your home so if you find that you’ve got last minute dinner guests it would be easy to whip one together. 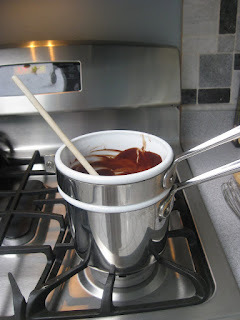 The recipe does require a double boiler like mine pictured below. If you don’t have one of these you can always use a bowl over a pot of barely simmering water and that should work just fine. Also wax paper is imperative to line the bottom of the pan (and don’t forget to butter underneath and on top of the paper. This allows the cake to come out smoothly…) And finally, it’s not in the recipe, but a small sprinkling of confectioners sugar on top is a nice touch. I would love to know… Do you have a signature cake? To see the recipe on the Epicurious website, click here. On this Valentine's week I thought it would be apt to do a post on romantic things like orchids and chocolates. A while back I did a video called How I Care for my Orchids that got a really big response from viewers. I decided to follow up on that video and show you the different orchid varieties I keep in my home and share with you even more tips for keeping beautiful orchids in this week's video: My Orchids. And as for chocolates... I know they can be a bit cliché for Valentine's day but I get them every year for Mr. Connoisseur none the less. I still get a thrill from a box of chocolates and would never turn down an occasion to receive them (I'm making the assumption that he feels the same!) This year his box, pictured above, is from Chocolate Opulence in Santa Monica, who create beautiful and aromatic French-style artisan chocolates that are made in Los Angeles. My favorites are the dark chocolate sea salt caramel (which seems to be a favorite of many people I know), the passion fruit cream and the dark chocolate crème. I would love to know... what are your favorite chocolates? And do you keep orchids in your home? 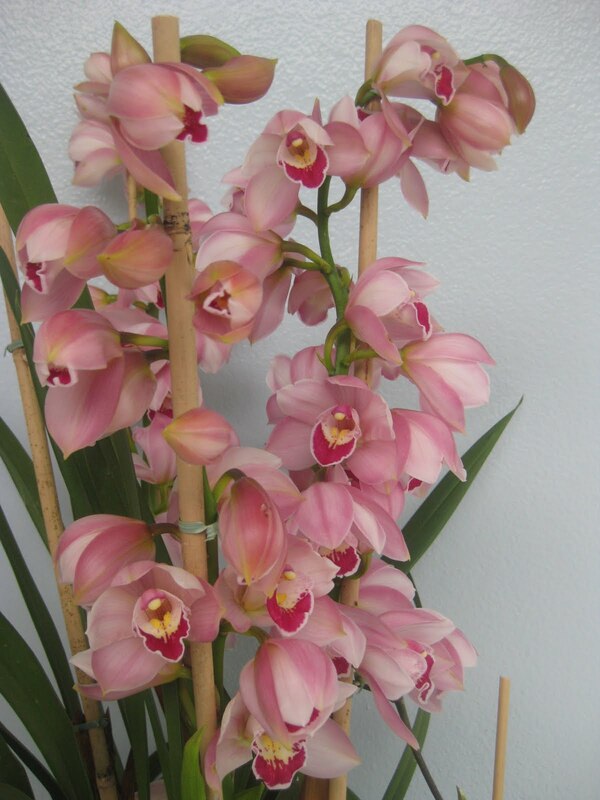 My cymbidium orchid is pictured above as are Mr. Connoisseur's box of Chocolate Opulence. To see my first video on How I Care for My Orchids click here. The other day I was in the grocery store with my daughter. It was close to dinnertime and I had a few things in my basket. I was placing the items on the conveyor belt to pay when a lady in yoga pants came up from behind me and asked if she could go in front of me because she only had one item to pay for. I looked at her, then I looked at my daughter, then I looked at my very pregnant belly and was absolutely appalled that she would even ask such a question. Yes, the etiquette stickler in me was horrified that she would ask to go in front of a pregnant lady. In my head I had a lot of responses I wanted to say to her that were not very ladylike. Clearly this woman thought her time was more valuable than mine. But I remembered my stance on always taking the high road and decided to avoid any confrontation. I think I was at such a loss for words, I just said, “OK”, and let her walk in front of me. She then proceeded to pay for her item but because she didn’t have her club card, took several minutes filling out a form for one. By this time my blood was boiling and I chided myself for not giving her a ‘high quality no’. I first learned about the high quality no from the philosopher Eckhart Tolle. He says there is absolutely nothing wrong with saying no. That no is a perfectly acceptable response to any question. The key is to say the no without anger, judgment, apologies or negative energy. A high quality no requires no further explanation and if I were to go back in time to deal with that lady again I would simply have said, “No”, and went on with paying for my groceries. I didn’t need to tell her that I was tired, it was almost dinner time, my daughter was hungry, we had to walk home and I was pregnant to boot! I simply needed to say “No” because it was my prerogative to do so. So as we navigate this tricky world of etiquette and high quality living, let us embrace the high quality no and not commit to doing anything that we don’t feel comfortable with. This past weekend I was featured on Rayna St. Pierre's wonderful blog, Bright Copper Kettles in an author interview. The interview discusses everything from interiors to morning rituals to culture! To see the interview click here. Until next time I would love to know… how are you at saying “no”?